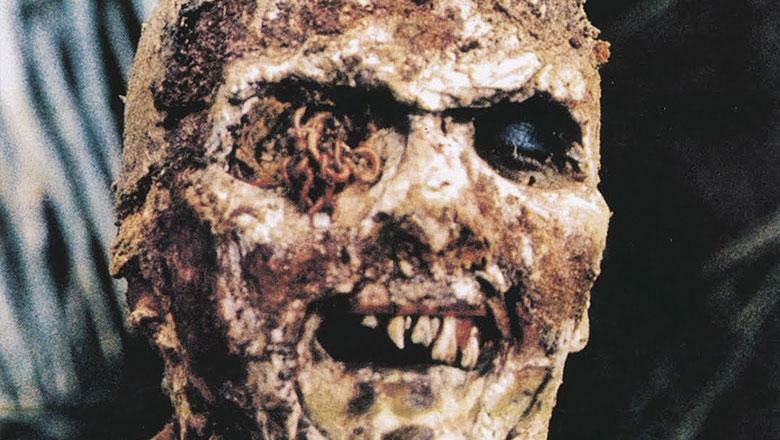 Zombie (also known as: Zombi 2, Zombie 2: The Dead are Among Us, and Island of the Living Dead). 1979. Dir. Lucio Fulci. Screenplay by Elisa Briganti. Starring Tisa Farrow, Ian McCuloch, and Richard Johnson. Blue Underground. Not Rated. 92 minutes. There are tons upon tons of zombie movies more rotten than the living dead themselves. A lot of low budget horror filmmakers think they’ll just load up the camera and a crew, use a little make-up and bare bones effects, and voila – they have a zombie film. In reality, it’s not that easy. Especially nowadays when the market is flooded with horror in general, let alone the plethora of poorly made zombie movies out there trying to be the next 28 Days Later or Night of the Living Dead. Lucio Fulci has made some great horror, but one of his best is certainly Zombie. I’m a huge Fulci fan. This is the first of his films I ever had the chance to see, as I didn’t often, growing up in a small town in the far east of Canada, get to see a lot of foreign stuff. Especially horror. Once I did, I devoured people like Fulci, Mario Bava, Dario Argento, and so on. Fulci has made some great horror. One of my favourites is his psychologically terrifying masterpiece A Lizard in a Woman’s Skin; one of the most beautiful, gripping, and weird movies I’ve ever seen, a classic. Although, there are a bunch of his films I absolutely adore. He’s a king among filmmakers. He worked great with practical effects, plus many of his movies had great scores, which is something I always love about a creepy film. The very first scene of Zombie shows us a blast to the head of a corpse wrapped up in burlap and rope; immediately, we know there will be plenty of blood and guts and dead things. A man holding the gun has put whoever it is underneath out of their misery. Cut to a boat with nobody on it sailing in from off the coast of New York. On it, two police officers end up encountering a massive, terrifying man who seemingly cannot be killed; one of them is bitten in the neck. The other sends him falling into the ocean. From there, a journalist, an ethnologist, and a scientist all tie into a story involving – you guessed it – the living, walking dead. One of the best and most noticeable thing about Fulci’s Zombie is the fact he uses incredible practical effects. Not only that, he shoots them in such way they look absolutely terrifying. For instance, one of the first scenes where the police are on the boat – when the large zombie comes above deck and lurches towards the second officer, there’s a really great shot of the zombie; I assume they probably used some sort of body mounted camera unit, as the camera itself points right at the zombie’s face sort of at a slightly lower angle around his sternum. There’s blood all over his mouth, his face in general looks decayed, a combination of muddy earth caked onto him and his skin cracking everywhere – it’s a great shot, and very effective. And especially for the 1970s in a zombie film, I love it. My main problem – the only problem – I have with Zombie is the fact there is some real hideously done dubbing here. A lot of these Italian horror films were often recorded half in English and half in Italian because of the cast members, and dependent on who spoke what – so I guess you can’t really blame it for not being perfect. That’s a lot of work to do on a movie, and to get perfect. It can’t be easy. That being said, I still can’t handle some of the dubbing in this film. It’s painfully bad at certain points. However, it’s a toss up – you can watch it in Italian on this Blu ray release with English subtitles, but you’re still getting a half and half mixture, as once again not all of the cast spoke the same primary language. I mean, the three starring actors in this film are an American, an Englander, and a Scot. So there’s nothing you can really do on either end. One way or another you’ll see some rough dubbing. It doesn’t spoil the film – I still love it. There are just times it drives me mad, so instead I focus on other things I really enjoy about Zombie. The effects here are excellent. Not only do we get some very great zombie moments, things we know will happen yet are still gloriously disgusting, but there is one specific scene I can never see too many times. Maybe you’ve heard of it – the shark versus zombie showdown. It happens on the ocean floor. One of thezombies is actually encased under some rock and sand and sea growth. He busts out, scaring a diver, and proceeds to have a nice little one-on-one with a shark. It sounds utterly cheeseball, and it really is, while at the same time I love every second. Because Luci understands it’s outrageous – it’s a shark and a zombie fighting. Incredibly hokey. But Luci pulls it off magnificently. The moment where the zombie comes out from the ocean floor and the diver fights for her life to get away, I always get a bit of heart palpitation going on regardless of the fact I know it’s coming. Then the music, of course. It’s actually hypnotizing. The zombie grabs the shark and tears out a chunk of its flesh, feeding away. They then face off, wrestle a bit – it’s incredible. The zombie gets his arm bitten off. It’s just really something to see – you won’t even believe it until you do. And the fact it looks really great, effects-wise, makes it more enjoyable than just a cheesy little bit. You’ll really get into it. The zombie designs themselves are really awesome. I find many zombie movies, even nowadays, go for a look I don’t particularly find that gruesome. Fulci’s zombies are rotten corpses. Some of them I can’t even imagine how they died, what happened to them, because their looks are so unique and different from a lot of typical zombie make-up. Plus, theflesh slurping, eyeball crunching zombie kills here are top notch! Really – this is probably one of the great masterpieces of zombie film, maybe horror in general. Certainly it’s one of the best horror films of the 1970s. So effective, so well-done. The look of the zombies and how Fulci showcases a few spectacular kills, it really puts this one over the top. I can watch it time and time again, and still I don’t ever get bored. Just as thrilling and fun as the first time I watched. There are so many awesome gory bits in this film, I really can’t list all of them off. As the movie progresses, they get better and better, I find. One small, almost throwaway gag is a zombie having the top half of his skull cut off; it looks really awesome, very realistic. It’s only a 3-second shot, but it is super effective and bloody to boot. One of the best and most horrific kills in the movie, arguably the most famous of the effects shots in Zombie, is a woman having her skull impaled through one eye socket, as one of the undead hauls her into a sharp piece of broken wood. This is just the be-all-end-all of eyeball gags in horror films, in my mind. You get to watch the iris and pupil curl up while the wood intrudes her eye socket – it’s gruesome. I think that also plays on a lot of fears people have about their eyes; such a delicate, sensitive area of the human body, and it’s easy for a sharp object to penetrate right into the back of the skull. I always cringe more at horror effects which really play on those types of fears and worries we have in everyday life. Overall, this has to be one of the best zombie films ever made. Not only that, it influenced generations of future filmmakers, as well as other artists, musicians, and video game developers alike. This movie proves you can do two things at one time: you can make a serious zombie film while simultaneously keeping tongue in cheek. There are a couple moments, such as the zombie versus shark scene, where Fulci reminds us zombie stories are not only about the horror they are about having fun. Just as George A. Romero does in most of his Dead films, Fulci includes the entertainment of getting to watch grisly kills and little bits of camp thrown in for good measure. There are a few fairly innovative bits here, as far as I’m concerned; Fulci uses a few techniques not many, if any, horror directors were using at the time. One of the body mount shots I mentioned earlier, plus a particularly neat point-of-view shot from the perspective of a zombie rising from the earthly grave where he was laid to rest, really shows how unique this movie is regarding horror, and most specifically zombie films. It’s one of the best horror of the 70s, and probably my top pick for a zombie flick, from any of them available out there. The Blu ray release from Blue Underground is pretty good. It’s not exactly running over with special features. I did enjoy the 10-minute featurette showcasing a ton of posters and stills from the production of Zombie. It’s awesome to see a lot of the different art and photos used in the promotion of the film. Unfortunately, this is probably the best of all the extras. Really, there isn’t much else. Although, the audio commentary during the film with star Ian McCulloch is great. Fun to be able to hear some of his thoughts, as someone who was involved in the film. Aside from those bits, nothing else is present here that would really blow your mind. The picture and sound of the transfer itself is amazing. I can’t knock that whatsoever. Being able to see this beautiful 1979 film in flawless high definition is something else – not to be missed. As a huge fan already, I was very pleased to watch this, experiencing all the kills and the delightful undead moments in a big gorgeous picture. The score really pumps on this release, too. Big plus. There’s also a little introduction by director Guillermo del Toro, which is pretty cool. Doesn’t really make up for the lack of much else – still a fun treat. I really wish this had more on it, but still worth the purchase. There’s a newer release I believe with a bunch more extras, so I’ll definitely have to get onto that one of these days when I can. This is one of those films I’d own it in every format possible because I really love every last second – I really cannot get enough. I love to watch this at least once or twice every couple months. It’s that damn good. For the zombie lovers, if you haven’t seen this you are sleeping! Those who love old school horror, practical effects, and some of that good old fashioned horror fun, this is the film for you. Get a copy of Lucio Fulci’s Zombie as soon as humanly possible. Then, feast your eyes upon the ultimate in zombie horror— they are going to eat you!